Chipless RFID Reader Design for Ultra-Wideband Technology: Design, Realization and Characterization deals with the efficient design of Field Programmable Gate Array (FPGA) based embedded systems for chipless readers, providing a reading technique based on polarization diversity that is shown with the aim of reading cross-polarized, chipless tags independently from their orientation. This approach is valuable because it does not give any constraint at the tag design level. 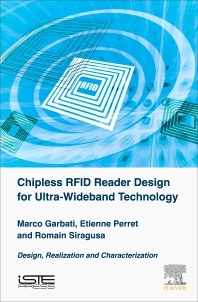 This book presents the state-of-the-art of chipless RFID systems, also providing useful comparisons. The international regulations that limit the UWB emission are taken into consideration, along with design guidance. Two designed, realized, and characterized reader prototypes are proposed. Sampling noise reduction, reading time, and cost effectiveness are also introduced and taken into consideration. Romain Siragusa is an Associate Professor at the Grenoble Institute of Technology, France. He conducts research on radiofrequency, in particular leaky-wave antennas, RFID and chipless RFID.